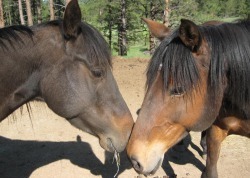 Pashta - Animal Wonders Inc.
Pashta (left) was adopted from Willing Servants, a horse rescue and adoption organization in Montana. Her original owners couldn't provide for her anymore and she needed a home that could give her the time and care she deserved. When we first met Pashta she had a fear of ropes and passively avoided humans. Once at Animal Wonders she began her training. Using only positive reinforcement and introducing new concepts slowly, she overcame her fear of ropes. She now readily helps put her halter on and eagerly awaits the next behavior she's going to learn. Pashta is currently learning how to pick up her feet, walk calmly outside her corral, and generally trust humans. She is very intelligent and is also learning other fun behaviors like "kiss" and "lift your lip". Now that she realizes good things happen when she learns, she's ready to communicate positively with humans most of the time.